↑ Rice, Howard L.; Huffstutler, James C. (1 January 2001). Reformed Worship. Westminster John Knox Press. p. 197. ISBN 9780664501471. 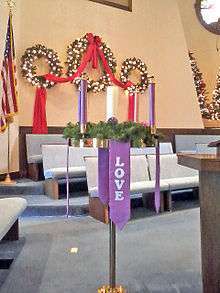 Another popular activity is the "Hanging of the Greens," a service in which the sanctuary is decorated for Christmas. ↑ "The Chronological History of the Christmas Tree". The Christmas Archives. Retrieved December 18, 2007. 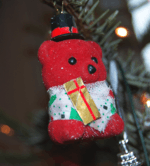 ↑ "Christmas Tradition – The Christmas Tree Custom". Fashion Era. Retrieved December 18, 2007. ↑ Murray, Brian. 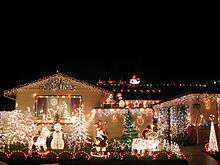 "Christmas lights and community building in America," Archived October 26, 2006, at the Wayback Machine. History Matters, Spring 2006. 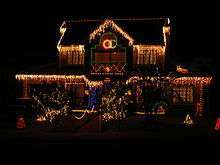 ↑ BBC – London's Oxford Street and Regent Street Christmas lights have been switched on at precisely the same time. ↑ Gifts, Unusual. "ThanksGiving Preparations". Unusual Gifts. Sravan.